For most companies in the 21st century, regardless of their size, their server room is the heart of their business. It’s the place where they store the data that is essential to their business. Information on clients, projects, sales opportunities, financial transactions, important contracts, employee information, compliance with government regulations, statistical reports, sales reports and more. Most businesses spent a lot of time and money protecting access to this information, making sure that all their virus protection software is up-to-date and that hackers trying to penetrate their systems are rebuffed. But these possible dangers are much more obvious than the one that can cause the greatest damage. Imagine if something happened that destroyed this important data. Think of what it would do to your business. If you suffer an equipment malfunction, think of the financial losses you sustain. And while there may be causes of equipment malfunction over which you have limited control, the main culprit is one that is easy to correct — contaminants introduced into the environment of your server room. What Causes Data Room Failure? 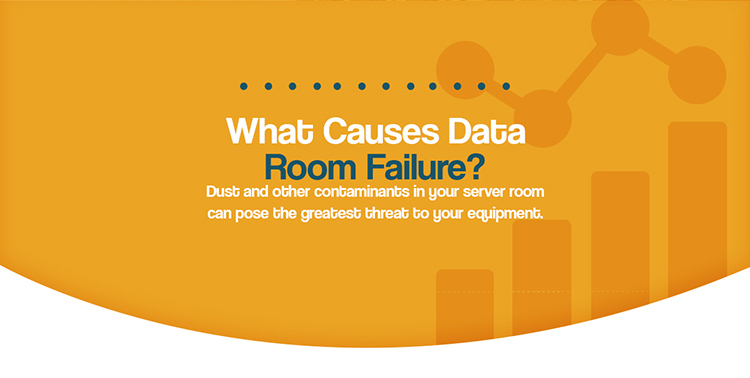 Dust and other contaminants in your server room can pose the greatest threat to your equipment. If you do not remove contaminants from your server room, you place your entire operation in jeopardy. According to a 2009 report, Effects of Dust on Computer Electronics and Mitigating Approaches, if dust is regularly not removed, the temperature of essential computer equipment can rise by as much as 30°F, and this temperature increase can bring about equipment failure on a large-scale. So, what are these contaminants? In the server room, you can find several different kinds of dust in a variety of sizes. To be considered potentially harmful to IT equipment, a contaminant must be mobile enough to reach the equipment — either airborne or transported via human contact — and have physical properties that make these contaminants harmful to servers, computers and other important electronic equipment. Zinc or metal whiskers can accumulate in hardware if you don’t clean this hardware on a regular basis. Some of the dirt and dust comes from human sources like dander, skin particles or clothing fibers. Belt debris, created by a data centers cooling system, is another contaminant to consider. But the number one way that contaminants enter a data room location is via the soles of the feet. Studies have shown that about 80 percent of the dust and the dirt that can cause the most damage in the service area enters in this way. Most people not trained in the importance of a clean environment in a data center space will probably not even notice these contaminants. But the downtime that they can cause can have catastrophic financial effects on the company. A 2011 study found that the cost per minute of data center downtime was $5,600. The cost of a single downtime event could cost a company $500,000. The cost of repair to the actual equipment was not all that expensive – about $10,000 per incident. Real cost came in the downstream effects – losses to the end user and IT productivity, for instance. The study found that the residual cost associated with data center downtime were far harder to remedy and potentially much higher. In the end, the report found that of the 41 data centers that participated in the study, the cost of the most recent downtime events that took place before the study was over $20 million. Keeping your data center clean is not only useful to keep your equipment in operation longer, but it may also be useful in keeping your business alive. 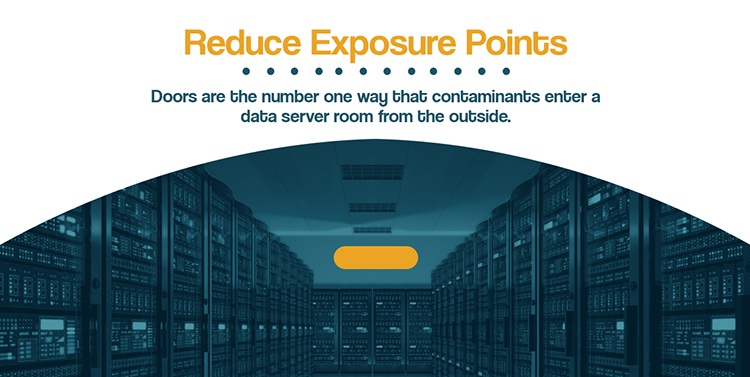 How Do You Keep Contaminants Out of Your Data Server Center? 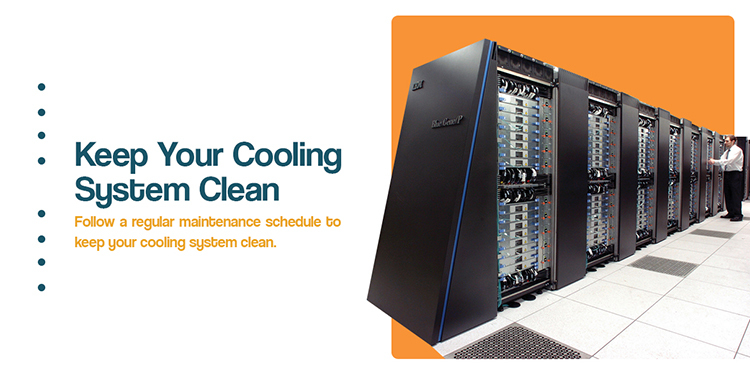 Ultimately, the only way you can be assured that your data service center is as free of contaminants as possible is to arrange a regular cleaning schedule. We will concentrate on that below. But before we talk about cleaning, some things can be done to limit the number of contaminants. While there are common sense ways that you can reduce some of the contaminants that enter into a data service center – hairnets and booties that go over shoes – there are three main things that you can do to help keep your server center in operation. Follow a regular maintenance schedule to keep your cooling system clean. All data centers need cooling systems. If you have a room full of servers, they can get hot at the best of times. Cooling systems help make sure that equipment does not overheat and cause unwanted downtime. But cooling systems also present problems of their own. As they circulate air throughout the server room, they can also circulate contaminants. One of the most dangerous contaminants is what is known as belt debris. Belt debris is created by the friction of slightly misaligned pulleys on cooling system belts. If not fixed, these belts can create thousands of particles daily, most of which will go by undetected. Regular maintenance prevents this. The pulleys in the cooling system should be regularly checked and properly aligned to reduce friction. It’s also possible to purchase low particle belts which shed fewer particulates during regular operations. It’s also a good idea as part of that regular maintenance schedule to shut down your entire cooling system and give the belt drive unit a thorough cleaning. Use a vacuum with a HEPA filter and clean the unit itself with antistatic cleaning chemicals on a microfiber cloth. Also, the air filters that you use for the entire cooling system should be regularly replaced every three months. As we noted above, humans themselves provide quite a few of the contaminants you can find in the data room – dander, skin particles and hair, for instance. So it’s important to regulate what your operators wear when they are in the data server room. This means wearing protective caps and booties on shoes. Another way to reduce human contaminants is to install contamination control mats at the data room’s points of entry. This will help remove some of the contaminants from shoes. Also, perform certain operations outside of the actual data server room. For instance, data service centers will regularly receive new equipment to replace older or failed components. All this new equipment should be unpacked and assembled in an area away from the data room. This reduces the possibility of contaminants from packaging and any dust that may have accumulated during shipping from being introduced into the data server center. It’s also never a good idea to bring cardboard into the data server center. And when you bring in the new equipment, and any tools that may be needed to assemble it, make sure you clean them with antistatic cleaning materials first. Doors are not friends to your IT equipment in your data room. Doors are the number one way that contaminants enter a data server room from the outside. One way to help reduce this problem is to install two sets of doors. People coming through the first door go through a small clean room where they put on their hats and booties and where contamination control mats may be installed. Never use automatic doors in a data server room. You don’t want the doors opening and closing every time somebody walks by the sensor. You should also check on a regular basis to make sure that all doors fit snugly in their frames. How Do You Clean a Data Center? 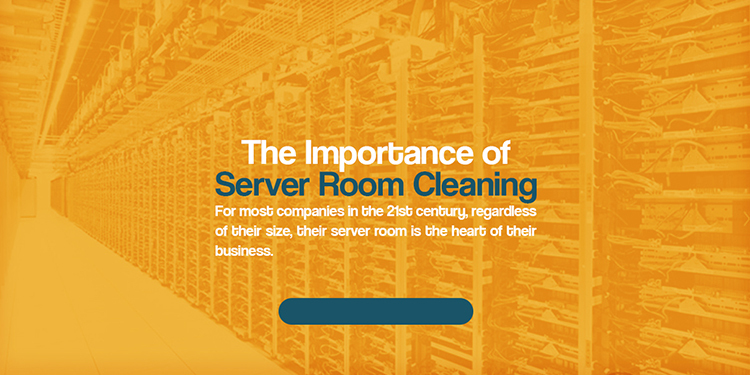 Now we come to the heart of the matter – cleaning your data server room. How often should you clean? While some cleaning measures should be done daily, most experts recommend that your server room should be completely cleaned at least once every three months. This doesn’t mean sending in the janitorial staff to mop the floors and dust. 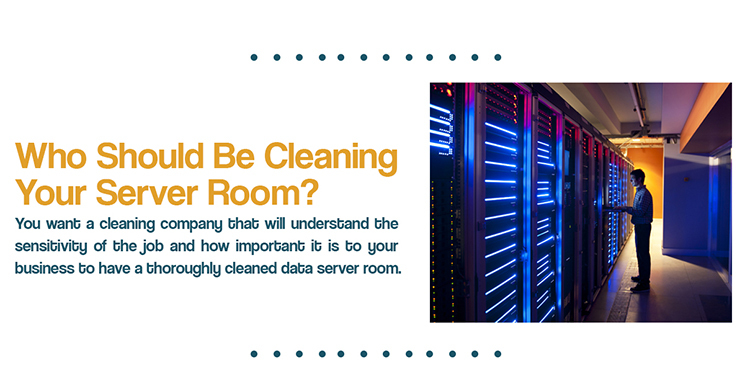 Properly cleaning a server room requires the attention of an expertly-trained team or the services of a professional cleaning company that specializes in cleaning data server centers. All obvious debris and garbage should be removed every day. If there’s a lot of traffic in the server room, it’s a good idea to vacuum it daily. Many server centers operate with a raised floor to accommodate cables and other IT equipment. A raised floor should be cleaned at least once a week. Never use a broom. Brooms only stir up contaminants and put them in the air. Instead, dedicate a dry mop to use to clean the floors. The mop should not be used to clean any other area of the data server center. A raised floor needs to be thoroughly cleaned once every three months. A vacuum with a HEPA filter is the best tool. 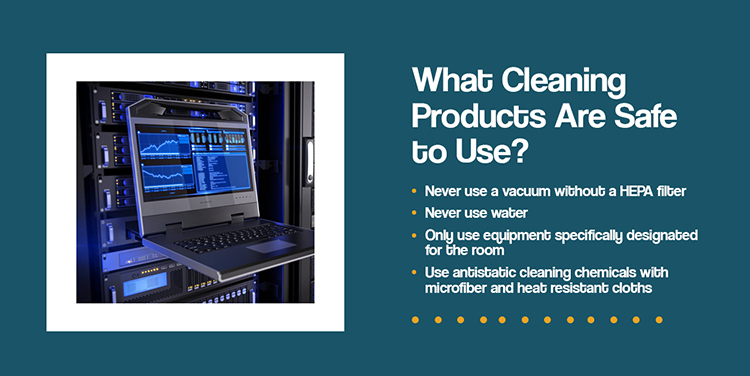 Then use a damp mop and cleaning chemicals approved for a data server room environment to wipe down the floors. This will remove any contaminants that may remain and it also helps dissipate any static. The reason you never use a wet mop or water when cleaning a data server room is that too much moisture can damage the floor. If the room contains any perforated tiles with dampers, they should be removed and cleaned outside the data room. Airborne contaminants will settle first on your server racks and the equipment placed there. As with the raised floor, thoroughly clean the servers and surfaces to remove all contaminants. Use a vacuum with a HEPA filter on the equipment, and make sure to clean the areas that may not be visible. Wipe server surfaces with damp wipes that contain approved antistatic cleaning chemicals. Make sure you also clean support equipment and rack tops. And don’t forget about the lights, windows and doors. These also need to be cleaned with the appropriate chemicals. Many data center server rooms contain a ceiling plenum. This is the space between the structural ceiling and a drop-down ceiling. Cables or ducts often run through this space. This area needs a thorough clean at twice a year, about six months apart each time. Again, use a vacuum with a HEPA filter and clean overhead airways with a cloth containing appropriate antistatic cleaning fluids. When you clean overhead regularly, you reduce the chance that contaminants will enter into the cooling system. It also helps reduce the risk of ceiling particles dropping onto the equipment or server floor. Like the overhead, you should clean the subfloor every six months. General cleaning reduces contaminant collection, but over time the daily activity in the data server center will lead to an accumulation of dust and dirt. The first step is to remove the raised floor tiles. Then use a vacuum with a HEPA filter to vacuum the space. Use a damp sponge to remove any additional contaminants, cleaning around cables. This also gives you a good chance to inspect the cabling in the subfloor for any signs of wear. It’s important not to do too much at one time. Experts recommend that a clean team should do no more than 24 square-feet at any one time. This restricts other contaminants from becoming airborne and means that IT equipment will suffer less disruption in airflow. To avoid false alarms, consider disarming smoke detectors while you clean. Occasionally, data server centers do renovations or deal with construction, perhaps to add room for more servers. When dealing with renovations or construction, never bring IT equipment back into a room before the area is completely and thoroughly cleaned. If you must bring some of the equipment into the room, never turn it on before the cleaning is completed. This is a situation where it is probably more logical to hire a company that offers professional cleaning services for data server centers. They will have the trained staff and the proper equipment to make sure that the job is done thoroughly and quickly. If a disaster occurs, such as a fire in the data room or a flood caused by a tropical storm or hurricane, engage the services of a professional cleaning company. When you’re dealing with a disaster situation, the most important factors to consider are the amount of time needed to clean the damaged area and how thoroughly and efficiently that cleaning will be. A professional cleaning company can also play an important role in recovering and restoring any equipment damaged in a disaster. What Cleaning Products Are Safe to Use? When cleaning any of the areas mentioned above in a data server room, you want to use cleaning equipment appropriate for the task. Vacuuming should never be done without a HEPA filter. These filters are designed to prevent dust and other particles from being released back into the air by the vacuum. As we noted above, never use water when cleaning a data service center. The moisture from water can cause damage to both the IT equipment and the floors of the center. If you have an in-house team trained in the proper techniques of cleaning, make sure they only use equipment that has been specifically designated for that room. Don’t just grab a mop from the janitor’s closet. The idea is to keep outside particles as far away from the server room as possible. Antistatic cleaning chemicals should also be used with microfiber and heat resistant cloths. Who Should Be Cleaning Your Server Room? If you’re going to clean your data room in-house, then you should have a data center manager who is trained in the maintenance and cleaning of the data server room. It would be the manager’s responsibility to maintain a regular cleaning schedule and to train a team in the appropriate way of cleaning a data server room. It may not be practical, however, or financially feasible to have your own specific in-house data room cleaning team. Do not, however, just shift this task to the company who provides regular cleaning or janitorial services for your company. In this case, it makes much more sense to hire a company that specializes in cleaning data server centers. When you’re doing your due diligence about the right team to hire, your immediate concern should be the kind of training the company has given to its employees to make sure they know how to clean a data room properly. You don’t want anything to do with the cleaning company that says they can clean your server room but has not given any employees the specialized training needed to do so. You want to find a company that has obtained the proper qualifications and certifications offered by a recognized training program. You want a cleaning company that will understand the sensitivity of the job and how important it is to your business to have a thoroughly cleaned data server room. Ask for references. Find a cleaning company that has worked for other data centers and check the quality of the work they’ve done in other places. Do your due diligence because it’s an important choice. And don’t fool yourself into thinking, “Oh, it costs too much money, I’ll just do it myself.” Remember those figures we mentioned above about how much you can lose if you have a data server failure. Spending a little money now will save you a lot of money in the long run. 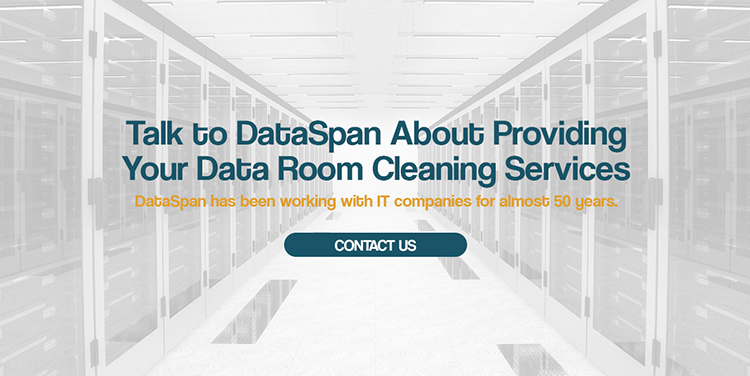 DataSpan has been working with IT companies for almost 50 years. We first opened our doors under the name Media Recovery, dedicated to helping data centers recycle magnetic tapes and printer ribbons. We’ve grown over the years into one of the key distributors of data storage services and products in the United States, serving many Fortune 1000 clients. We understand how debilitating downtime can be to a data center. That’s why we have provided cleaning services to data centers for many years. Our cleaning teams have the specialized training and the right tools to make sure that your data room is cleaned as thoroughly and as completely as possible. We also offer a discount program for companies that have several data centers located across the country. 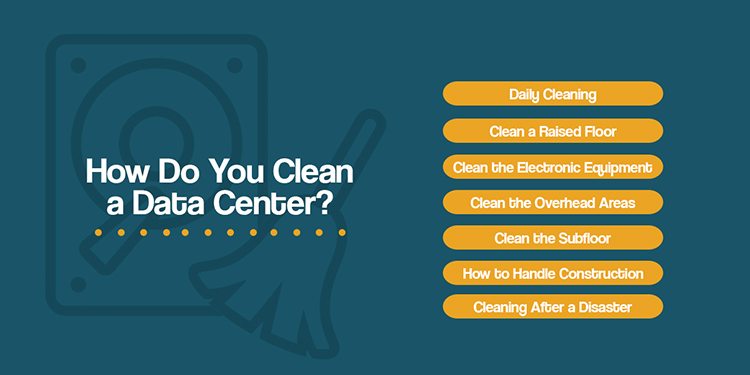 If you’re interested in learning more about our data center cleaning services and how we can make sure that your data center remains up and running on a consistent basis, call us at 1-800-660-3586 or visit our contact us page and we will get back to you shortly.